« I Sense Trouble On the Horizon . . .
You receive a gift that is bittersweet and nostalgic. What is it? Now this certainly leaves the door open to a lot of things for you. It could harken back to something that you remember having when you were a child or perhaps it is something that is meaningful to you from early on in your adult life. After giving the question some consideration, it made me think about not only something that I would like to have that fits this description but it also brought back to mind some things that I still possess that bring back that sense of nostalgia. We all like to have something that reminds us of a happy time from years ago, whether it happened when we were kids, when we were youngsters in school, in high school, in college, from early relationships or just any time in general that brings back a pleasant memory for you. I do have a few different things that make me feel this way and I keep them in a small box on my dresser. Just looking through there, some of the things that are in that space include the hospital band that I wore from when Sean was born, a pair of cufflinks that belonged to my dad, my high school ring and Michelle’s high school ring and a few other miscellaneous pins and trinkets that I had picked up along the way throughout school and my work career. I also have a couple of other things that go farther back to earlier times in my life. I have a couple of hats that belonged to each of my grandfathers that I keep in the closet. I also have the first baseball bat that my father bought for me (it’s a Johnny Bench model in case you were interested) and I also have a notebook from high school that I kept some writings in that I and some friends of mine put together many years ago. Now if someone were to show up at the house or present me with a gift that would be bittersweet or nostalgic, I would think it would have to be something that would bring back some memory of the fun times I had at my childhood playing. There were a lot of different things I could think of, including the teddy bear I used to have when I was very little (his name was Rufus). 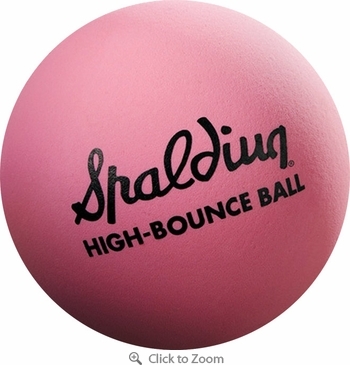 But I think if I had to narrow it down to just one thing that would really bring back some nostalgia for me it would be a simple, rubber Spalding ball. When I was growing up, we would spend hours doing all kinds of things with just that simple ball. The times that we spent playing stickball in the street, having a catch or playing stoop ball in front of our house in Ozone Park where my grandparents house in Brooklyn. Just seeing one I think would bring back a lot of good memories and fun times that we had. So that’s my answer to the question. What would be a great nostalgic gift for you? It can be whatever you want it to be; there are no restrictions or limitations here. Feel free to leave a comment here or you can catch up with me on Facebook or Twitter and leave a note there. I’m curious to see what people can come up with. I’ll also ask a few people on Twitter and see if they respond. And thank you to those who took the time to answer yesterday’s question. Sean and I are off to Citi Field again today for the Mets game so that should be fun for us and maybe we’ll actually get a home run ball today. It would be even nicer to get a win for the Mets but I’ll take whatever we can get. Check back again soon and see what the next topic of the day will be. Have a great day all!